Glynis Barber was born on October 25, 1955 in South Africa. Her maiden name is van der Reit. Originating from a middle-class Johannesburg background, she later joined the Progressive Party, a moderate anti-apartheid party. In her late teens she moved to England to attend the Mountview theatre school. After graduating Glynis Barber worked in repertory theatre and had little parts in films and on TV as well. Her marriage to a fellow student, Paul Anthony Barber, only lasted for a few years. Her mother died about the same time and her death had a big impact on her whole life, as she later said. Glynis Barber's big break on TV was in the role of Soolin in the fourth season (1980-1981) of the British cult TV-series Blake's 7. In 1978 she had already appeared on Blake's 7 as a Mutoid in the 9th episode Project Avalon. Her relationship with Steven Pacey, who played Del Tarrant on Blake's 7, lasted for some years after the show had ended. 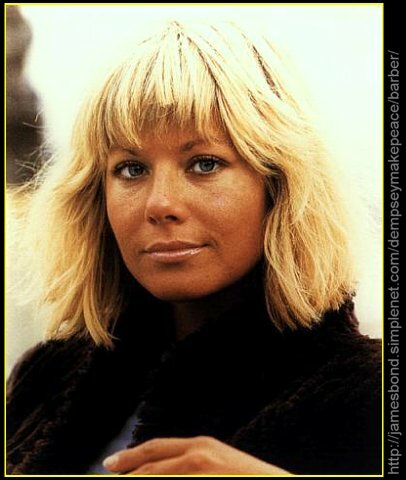 But according to various articles the relationship was well and truly over when her romance with Michael Brandon began during the filming of Dempsey and Makepeace. Dempsey and Makepeace, in which Glynis Barber played the role of Det. Sgt. Harriet Makepeace, lasted for three seasons from 1985 to 1986 and was sold to over 80 countries. Apparently her relationship with Michael Brandon had some rocky moments, but finally the two married on November 18, 1989. In 1990 they moved to the United States where their son Alexander was born on November 21, 1992. Then they moved back to the UK in 1996. Glynis Barber is a vegeterian. She likes reading and tennis, yoga and going to the theatre. Click on a thumbnail to get the full size picture. and on my Dempsey & Makepeace Page. My Dempsey and Makepeace WWW Page, dedicated to this 80s police drama starring Glynis Barber. Besides other things you can find more pictures of Glynis Barber here. Luisa's page of Dempsey and Makepeace also has a Glynis Barber Page. Interesting bio, more pictures, etc. David Murray's Blake's 7 and Beauties of Sci-Fi Pages had an AVI-movie of Soolin (2,1 MB). His page is now offline, but you can still download the movie from my server. His site has a picture of Glynis Barber from Blake's 7 and a Dempsey & Makepeace pic. If you are interested, you can also take a look at his Dana Delany Tribute Page. More links to some Blake's 7 Pages. The Glynis Barber related material on these pages is often scattered and therefore difficult to find. That's why I have provided direct links to it. But maybe I have missed some stuff and Blake's 7 is a great series, so don't forget to check out the Main Pages too. Paul James' Blake's Seven Pages. His screenshots from Blake's 7 have a very impressive quality. You can find his Glynis Barber pics here: 1 | 2 | 3 | 4 | 5 | 6 | 7 | 8 | 9 | 10. He also has a contact sheet and a list of all season 4 pictures. Horizon, the Blake's 7 Appreciation Society. and a lot of Blake's 7 merchandise available for purchase. The Lysator FTP Archive with a lot of Blake's 7 material (pictures, sounds, scripts, etc.). Blake's 7 Sounds by H. Melton. It has a photo of Steven Pacey and Glynis Barber from The Further Adventures of Lucky Jim. Josette Simon, Steven Pacey, and Glynis Barber in a candid shot taken on location at The Quarry. The Blake's 7 Library (formerly known as the AOL B7 Library). Look at their GIF Collection #2, especially "Glynis Barber (Soolin) gives an interview", "The 4th series crew" and "Glynis in The Further Adventures of Lucky Jim". Her Blake's 7 - Who is who has a picture of Glynis Barber as Soolin and two shots from The Wicked Lady. Neil Faulkner's Sevenclopedia is now online on her web page and the Soolin entry is here. The Federation Image Bank 1 has a picture of Soolin and Avon from "Headhunter". Susan Clerc's Adrenaline and Soma Powered Blake's 7 Pages. Donna Randall's The Blake's 7 Universe.